Some time ago I did a sci-fi themed smuggler hideout. I liked the idea myself and wanted to do a fantasy version of it. This hideout could be hidden in a rocky bay that’s usually avoided by most seafarers. It has some natural caverns that are adapted to be used as a warehouse and some rooms with beds for short stays or to accommodate people that are going to be transported away on a boat later. Lately I’ve been practicing the coloring of my maps on my iPad Pro. I have found some promising techniques that have made it a bit easier to do the coloring and shading digitally. 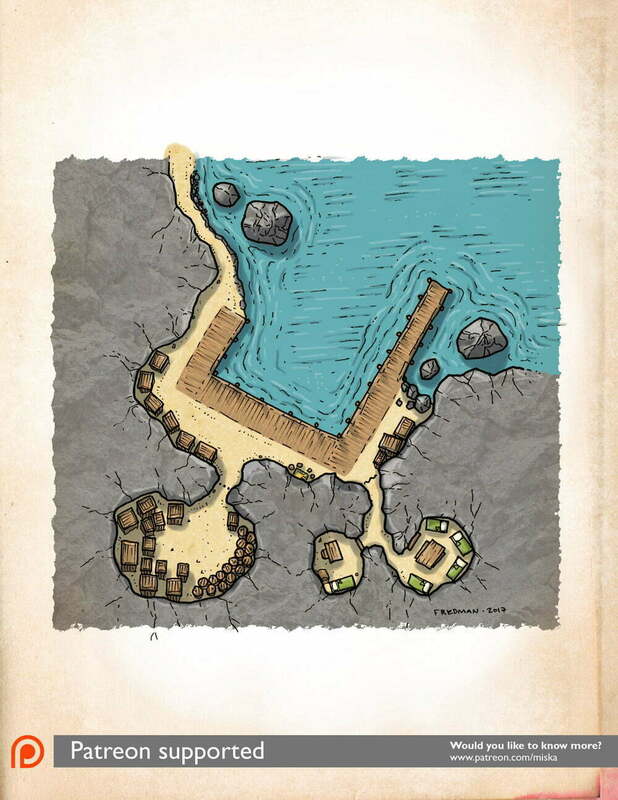 For high-resolution waterstamp-free versions of this and other of my RPG maps, please, check out my Patreon page and storefronts in DrivethruRPG and RPGnow. This map was originally published on Patreon with the support of my awesome patrons in May 2017.